If you’ve never had Beef Brisket Burnt Ends before then you have definitely been missing out! When beef brisket is cooked low and slow, smothered in delicious marinade and BBQ sauce, the end result leaves the most juicy, tender ‘burnt ends’ of the brisket which are arguably the best part and certainly worth the wait. They are simply cut off from each side of the meat and diced into bite-size cubes of absolute heaven! 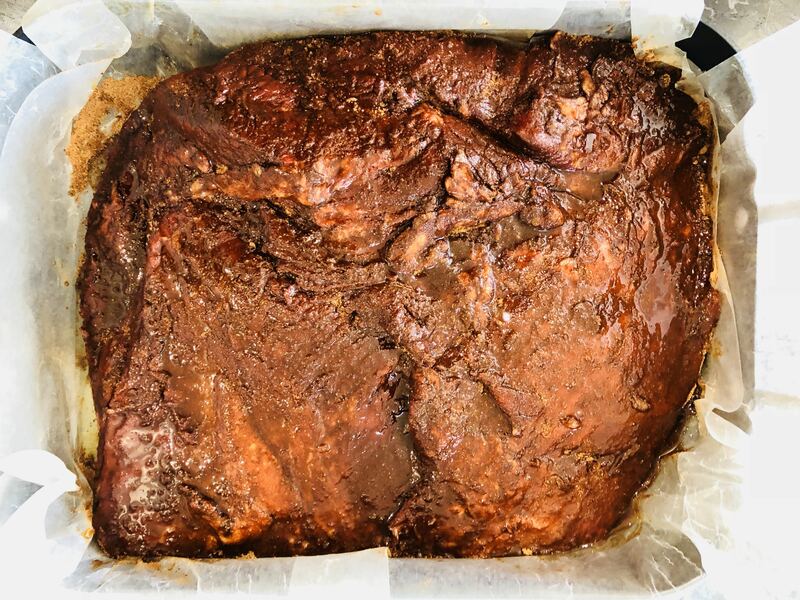 This beef brisket burnt ends recipe uses a short cut way to cook your brisket to perfection. 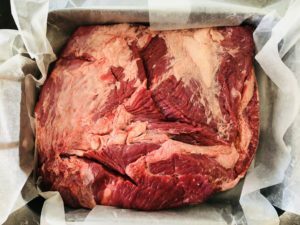 Brisket comes from the shoulder of the cow and is a lean and muscular piece of meat which requires low and slow cooking to get it nice and tender to the point where it starts to fall apart. Getting your brisket to this point can often take 12 hours of cooking or more (depending on the size of the piece of meat) plus marination time, but if you don’t have that amount of time (or patience!) then here’s a short-cut way which still gives you the ultimate result. As with all slow cooking, preparation is key so I would certainly recommend overnight marination in The Food Beaver BBQ Seasoning, or a minimum of 2 hours. This recipe serves 2 people as a main dish without any extras or 4 people with other accompaniments (for example buns, sweet potato fries, BBQ beans, corn etc) and takes 4 hours cooking time in the oven. Approx. 1kg or 2lb Beef Brisket. Approx. 30-40g of The Food Beaver BBQ Seasoning. Half a small-medium white cabbage – finely shredded. 2x medium sized carrots – finely shredded or sliced into strips using a potato peeler. BBQ Sauce – please see below for homemade BBQ sauce recipe. Oven dish and tin foil or wax paper. Mix all the below into a mixing bowl then transfer to saucepan to heat gently and infuse all the flavours. Finally, put some aside for your baste and glaze during cooking. Half tablespoon dark soft brown sugar. 1x clove of garlic – crushed or half teaspoon garlic powder. Half medium sized white onion blended/very finely chopped or 1x teaspoon onion powder. Half teaspoon ground allspice (or you can use a combination of mace, nutmeg, cinnamon and cloves). Quarter teaspoon ground black pepper. You can also add extra chopped fresh chilli or chilli powder for a bit of a kick! 1. 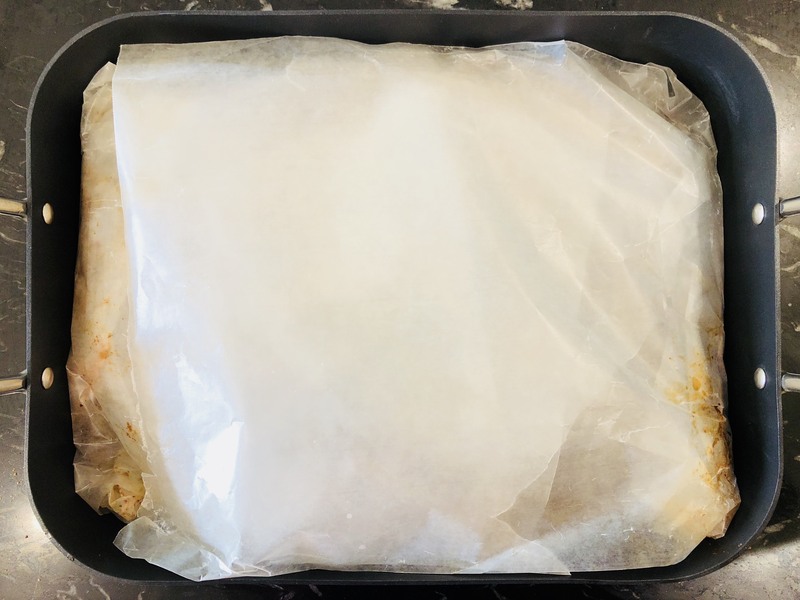 Firstly line the baking dish with foil or wax paper large enough to completely wrap the brisket from both sides, then place the brisket inside and rub the BBQ seasoning all over on both sides. 2. Now add a drizzle of olive oil over the top of the meat and rub in, making sure all the meat is covered in seasoning and oil. Repeat for the other side then wrap into a parcel making sure there are no gaps. 4. Leave to marinate in fridge from 2 to 24 hours, depending on how much time you have. 5. Preheat oven to 120°C/100°C fan. 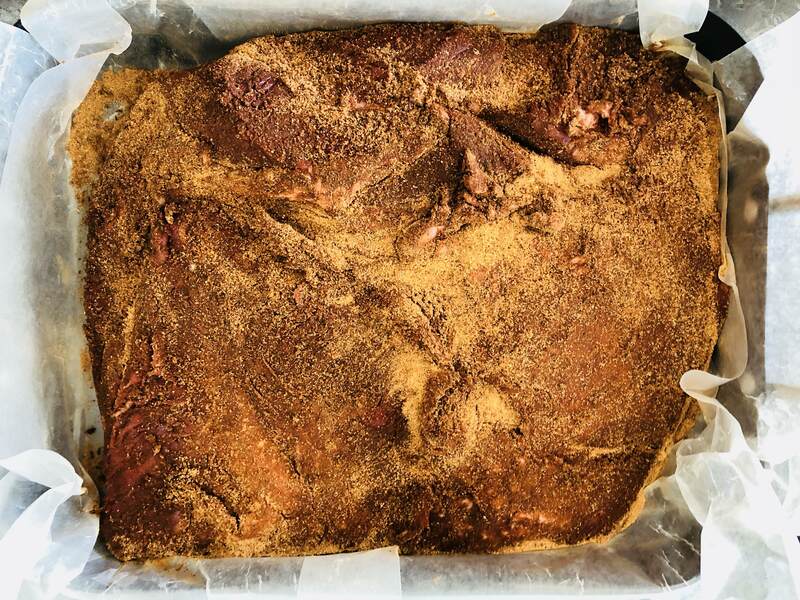 Gently uncover the top of the brisket, remove the meat from wrapping and baking dish and cut into approx. 1 inch cubes (this will help speed up the cooking process) then return to the wrapping/baking dish. Glaze the top of the cubes with some of the BBQ sauce, re-cover/seal and put in the oven for approx. 4 hours or until the chunks of meat are just starting to fall apart. Every hour during cooking, uncover again, baste with the juices, glaze with more BBQ sauce and re-cover. Once cooked, leave covered and rest for 30 minutes. 6. To make the slaw. Whilst the beef brisket burnt ends are resting, mix the white cabbage, carrots and mayonnaise together into a bowl and then add a squeeze of fresh lemon juice and a pinch of sea salt and black pepper. Taste and adjust as necessary. 7. When ready to serve, uncover the cooked beef brisket burnt ends, drain any unwanted juices and glaze one last time with BBQ sauce. Serve a generous pile of beef brisket burnt ends and an equally generous pile of coleslaw. I guarantee you will be popping them in your mouth before the plate hits the table! I hope you like this beef brisket burnt ends with homemade coleslaw recipe, made with The Food Beaver BBQ Seasoning and BBQ Sauce. As always, your feedback is most welcome so please comment below or get in touch at thefoodbeaver.com or through Facebook, Twitter and Instagram. Shop here for The Food Beaver BBQ Seasoning!